The Healthy Diet Paradise has some important updates that need to be mentioned. I’ve had quite a few requests lately for either updated hair loss diet ebooks, or lost eBook replacements. If you ever lose your eBook and you need it to be replaced, use the contact us form, and I’ll email you a replacement copy at no charge. Please note: This replacement system is for either lost eBooks, or outdated eBooks from 2012, 2013, et cetera, Both eBooks are replaced free of charge. Please provide your PayPal transaction I.D. number with your request, and I’ll send an email with a PDF attachment. After years of working one-on-one with my clients firsthand, I developed a way to convey the hair loss diet information in video format. There’s no stone left unturned. The 90-minute Video Coach covers everything! Not only will you learn all seven concepts of the hair loss diet, but you will have a much deeper appreciation of why we operate the way we do. 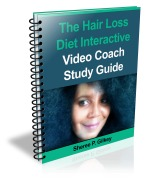 The Hair Loss Diet Interactive Video Coach now has a 25-page study guide that’s free with the download. For those of you who’ve already ordered the video, this is to let you know that you can still get your free copy of the study guide. And just like with our eBooks, if the Video Coach MP4 is ever misplaced or lost, it will be replaced free of charge. If you’ve already downloaded the Hair Loss Diet Interactive Video Coach, and you’d like a copy of the study guide, please use the contact form, and I’ll email the PDF file to you. Click here to download The Hair Loss Diet Interactive Video Coach. I’m updating the forum guidelines for the year 2017. Just as a reminder, back in the early days when we were very small, I could answer lots of questions through the forums. We did this without any problems for about 18 months. But when Google updated their algorithms back in 2012/2013, smaller submissions caused a big issue (penalties). So I had to change how the questions were answered in the forums. There are thousands of food types on the market that fall into the seven hair loss diet theory categories. So if any questions are related to the seven concepts, or they are theory related, I will redirect you to our training modules, i.e., our eBooks and training video. Any non theory-related questions can be answered in the forums. Or you can just share your experiences with us! There is nothing that gets me more revved up than a hair regrowth success story. Most of the people I have contact with were inspired by the powerful stories submitted in our forums. So please submit your pictures, your struggles, your successes, even your setbacks. Please write a page to let us know how your hair is growing back, the food choices you’re making, and how you’re feeling. Click here for the hair regrowth success forum. Stay strong and never quit!